Wow, this is our last block in the Mystery Seasonal Sampler. Next month I'll reveal how it all goes together. I was going to do the final block section and directions to set it together all in this post but decided against it. There are lots of pictures and it would make the post too long plus it's also Christmas and everyone is busy with shopping, last minute gift making, baking, parties, and family time. Let's get started with the tree. 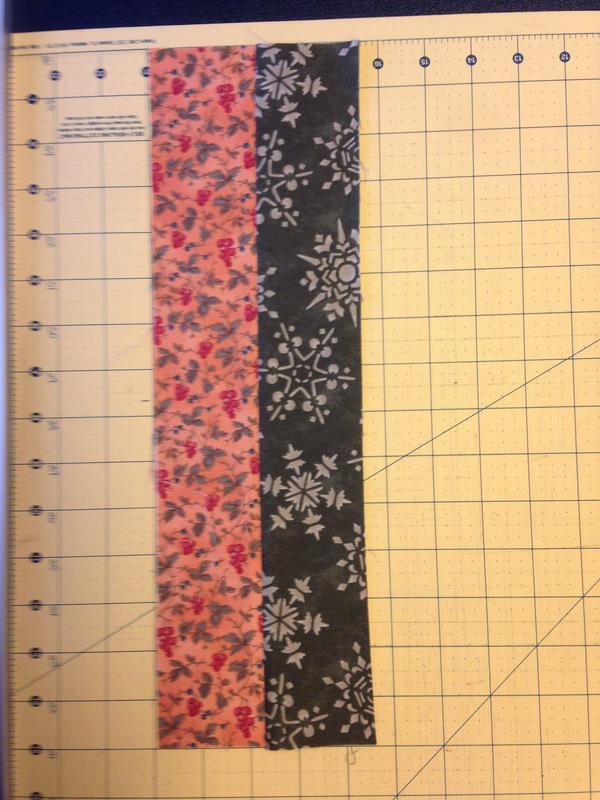 Measure down 2 1/2" on the outside of the 2 1/2" x 3 1/2" rectangles and make a small mark. Then draw a diagonal line from the small mark to the inner corner as show below. Stitch on the drawn line. 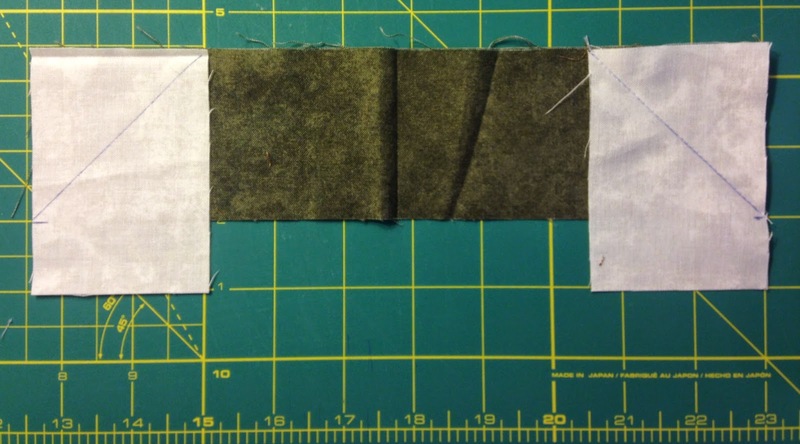 Trim off the excess 1/4" from the sewn line. Green 2 1/2" x 9" with Background 2 1/2" x 4"
Green 2 1/2" x 8 1/4" with Background 2 1/2" x 4 1/2"
Green 2 1/2" x 7" with Background 2 1/2" x 5 1/4"
Green 2 1/2" x 6" with Background 2 1/2" x 5 3/4"
And repeat this procedure for the gold 2 1/2" x 4 1/2" with Background 2 1/2" x 6 1/2"
Each strip set about should measure 2 1/2" x 12 1/2" unfinished. 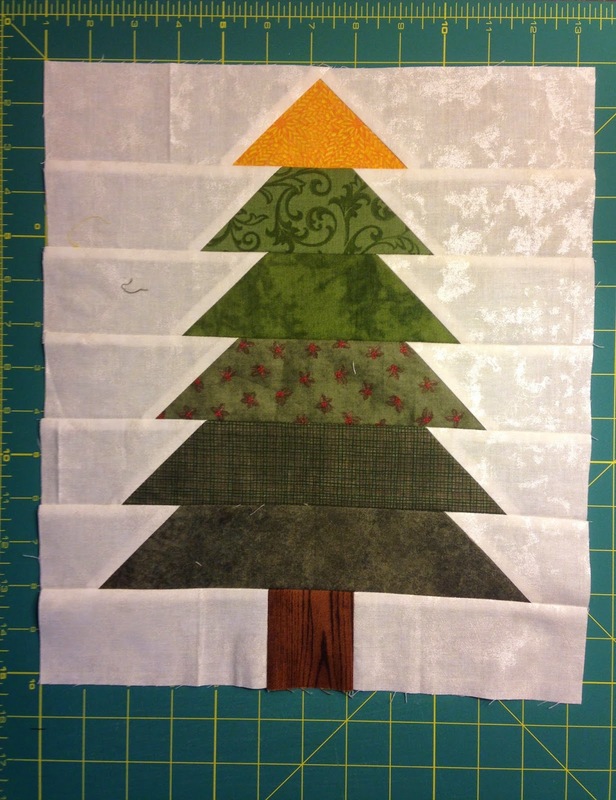 Lay out the tree as indicated below and sew the 7 rows together. Tada! Your tree is finished. 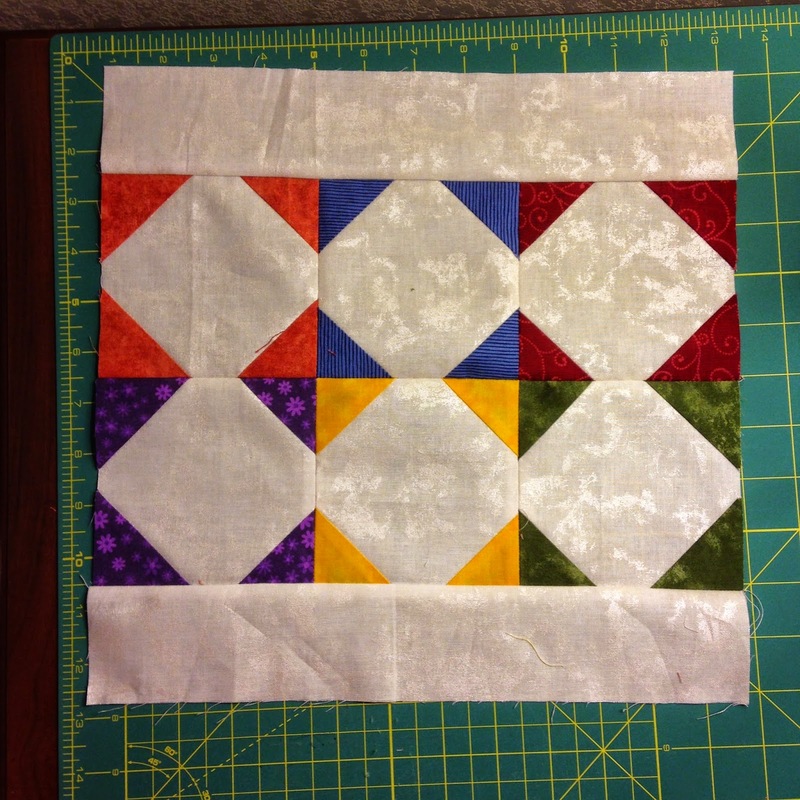 This block should measure 14 1/2" x 12 1/2" unfinished. This is how I make my snowball blocks. 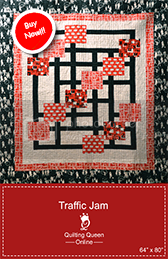 I learned it at Quilt Market. 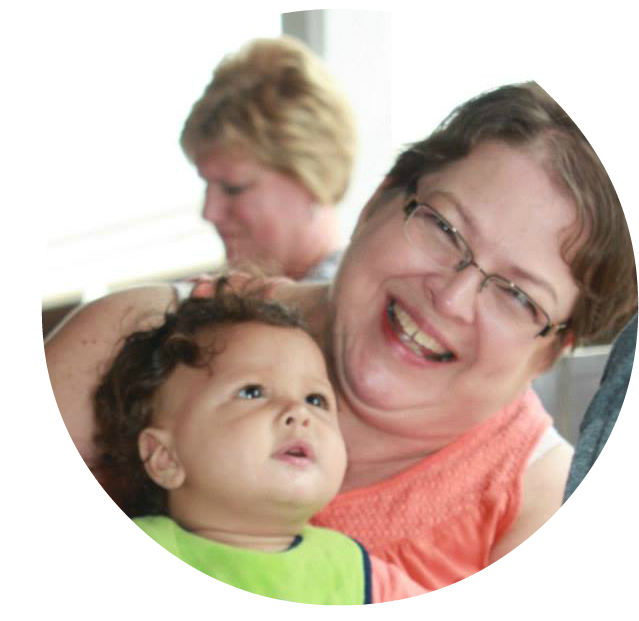 There is actually a specialty ruler to make this easier and in less time. I didn't buy it but wish I had of. Needless to say, I'm going to. 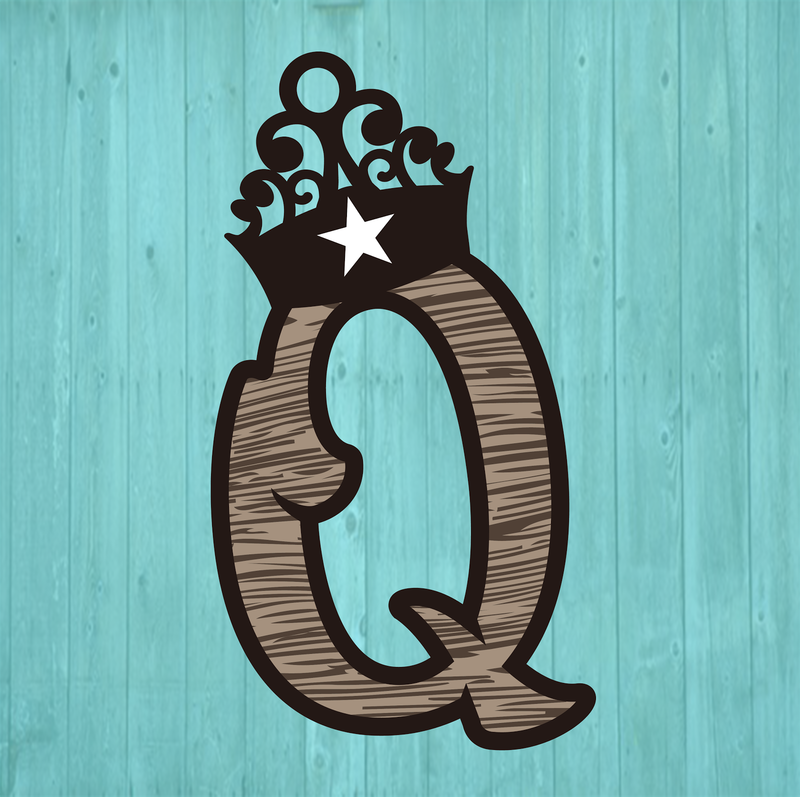 You can order your own ruler here. Here is a YouTube video. First pair a background square with a color square. 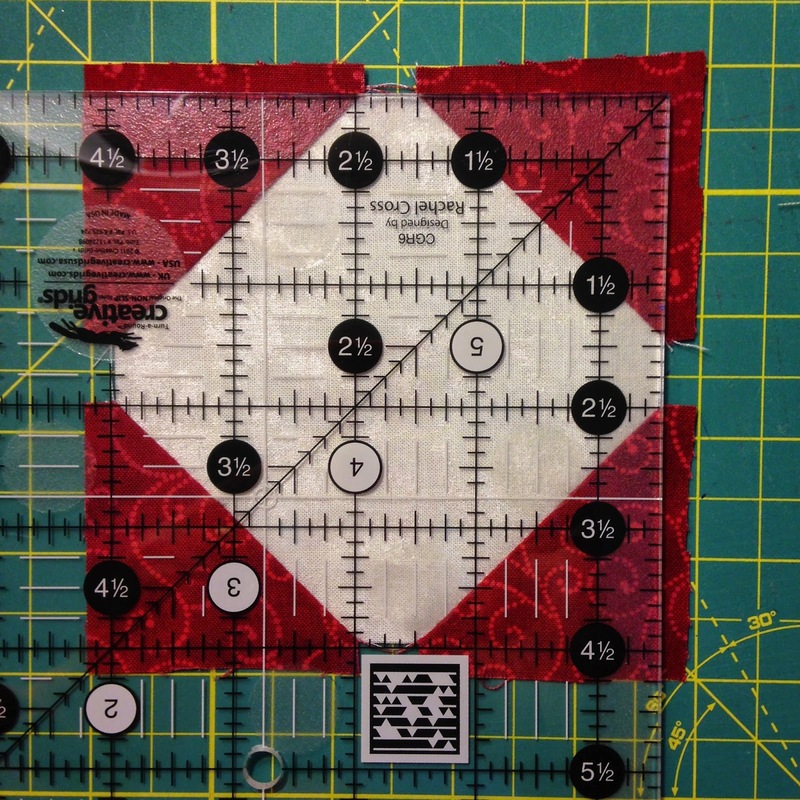 Then lay your pair of squares down on a gridded cutting mat and draw a diagonal line from 2" down on each corner. Mark all 4 corners and then stitch on the drawn line. I don't even cut my threads from sewing across one corner to the next one. I treat them as a chain piecing technique. 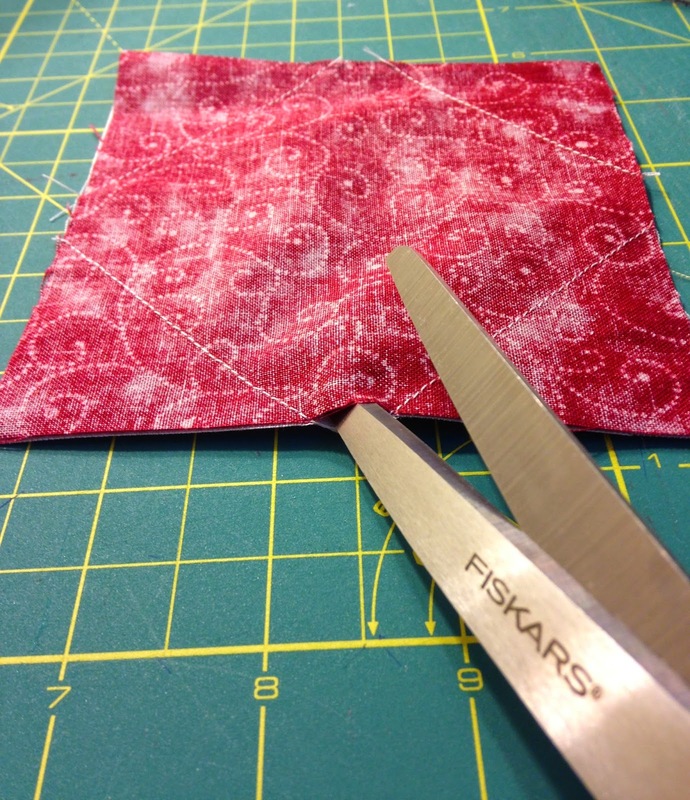 Once sewn, take your scissors and slip them between the two squares. You're going to cut the colored square NOT THE BACKGROUND SQUARE! Just cut across the square from one side to the other. You can eyeball it, it doesn't have to be exactly in the middle. Then cut the opposite side. Again eyeball it. Now trim off the corners 1/4" from the drawn line and discard the triangles. Press the colored squares out. You will end up with a block that looks like this. 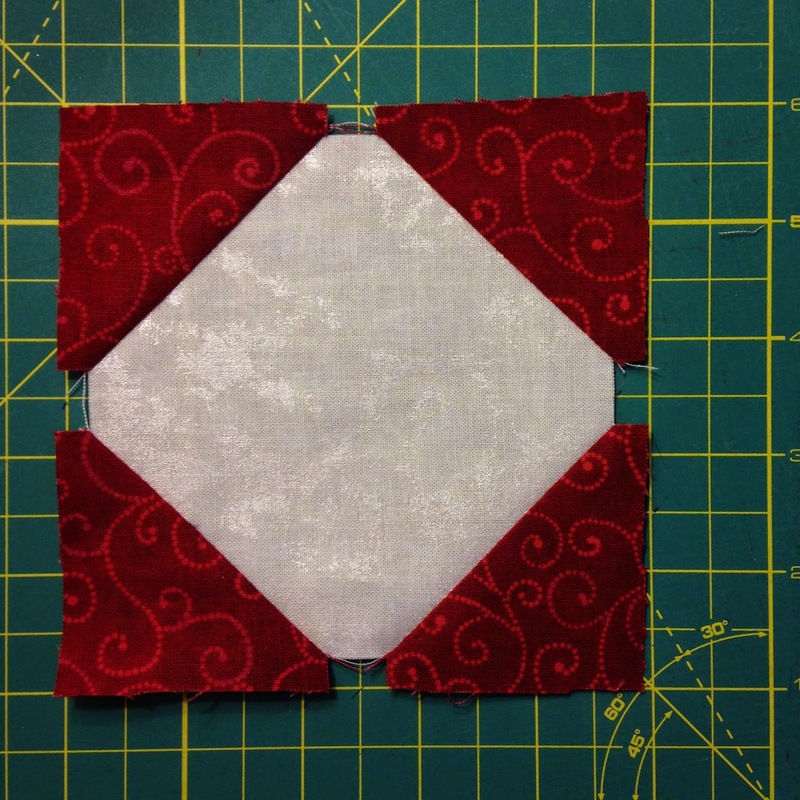 Now, using your square up ruler, and the sides of the background 4 1/2" square as your guide, square the block to 4 1/2"
Repeat this procedure for the other 5 colors. Sew 3 of the colors together to make a row 4 1/2" x 12 1/2" unfinished. Repeat for a second row. Sew the 2 rows together. Add a 2 1/2" x 12 1/2" strip to the top and bottom of the snowball block unit. Now you're ready to make the "gifts" that go under the tree. 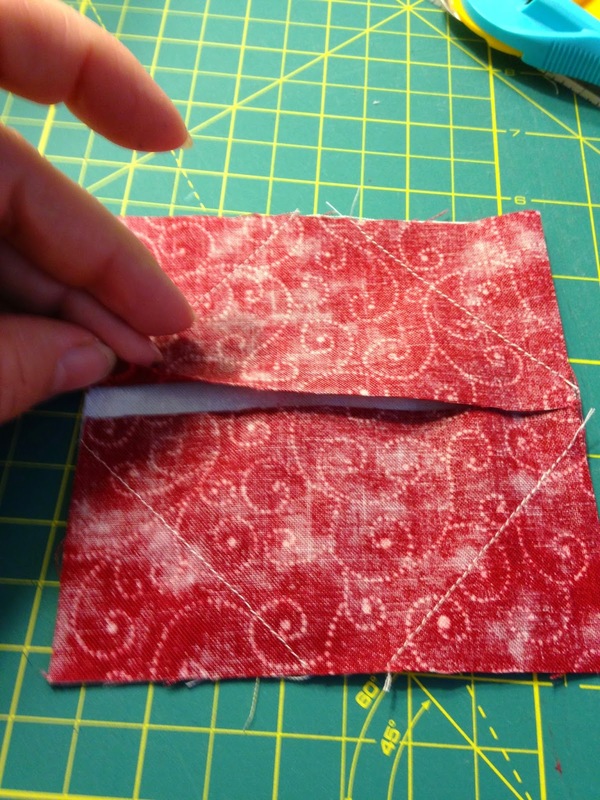 Sew various colored satin or grossgrain ribbon to the "package" blocks cut above. I apologize that there are no pictures of this step. I got so excited about makeing the packages that I completely forgot all about taking any photos of the process. But I think you can do it without the pictures. 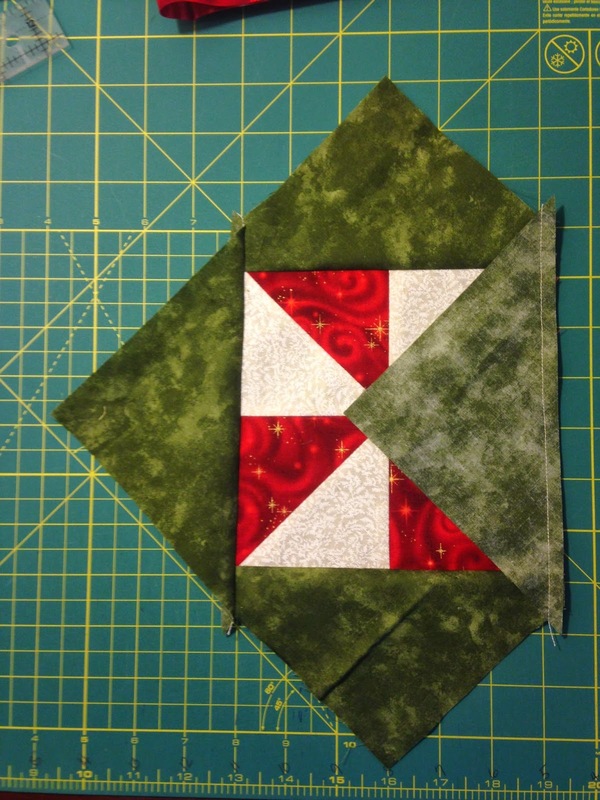 Sew the 1 1/4" x 3 1/2" rectangles to each side of the green 3" x 3 1/2" rectangle "package". 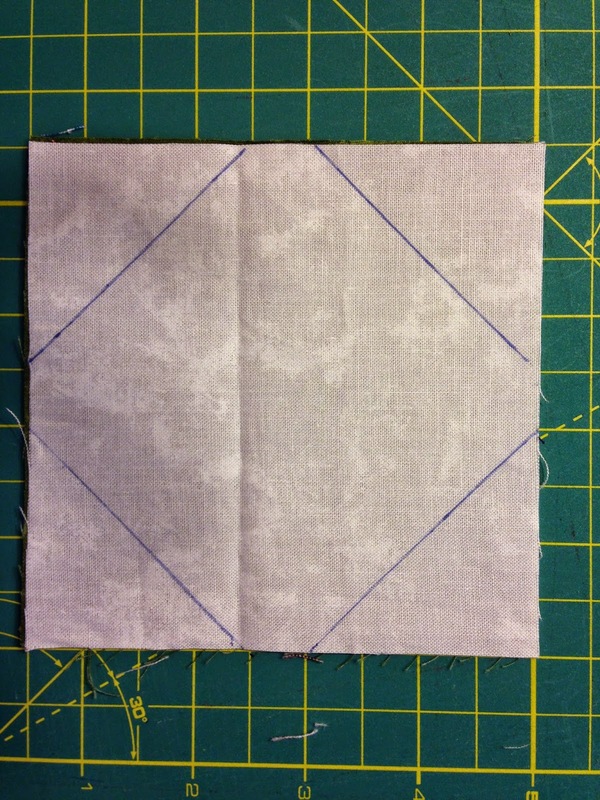 Sew the 1 1/2" x 2 1/2" background rectangle to the bottom of the yellow "package". Sew the packages together as shown below. 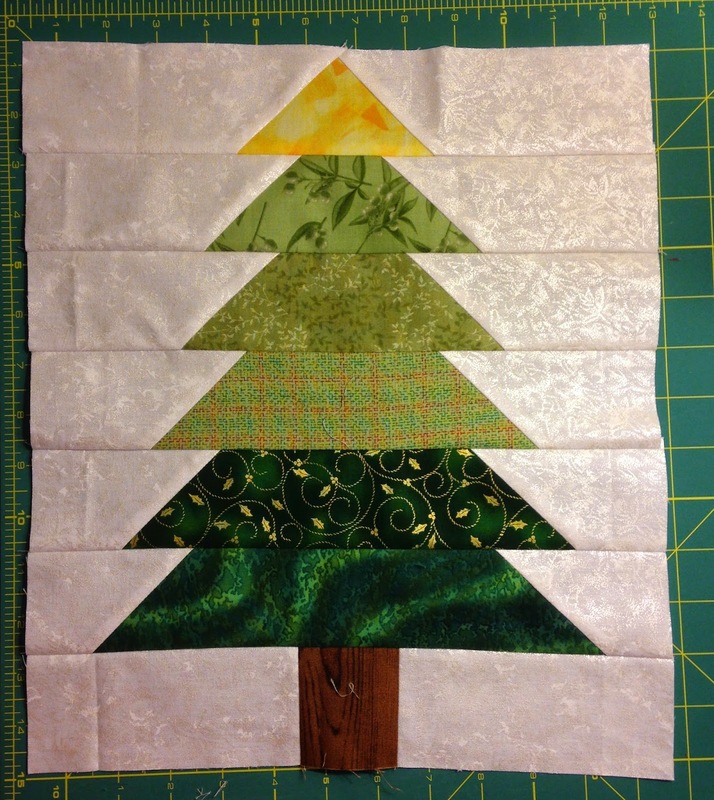 Now sew the snowball unit to the top of the tree block. Sew the package unit to the bottom of the tree block. This should measure 12 1/2" x 30 1/2" unfinished. The final section of this set is the Candy Pinwheel block. 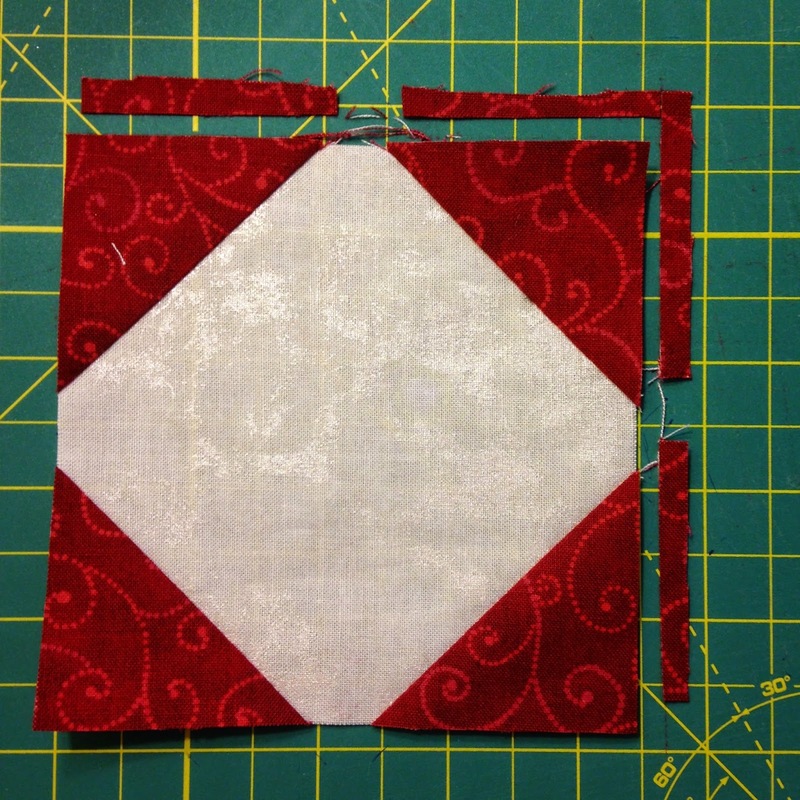 Pair a red 4" square with a white 4" square. Draw a diagonal line across the white square. 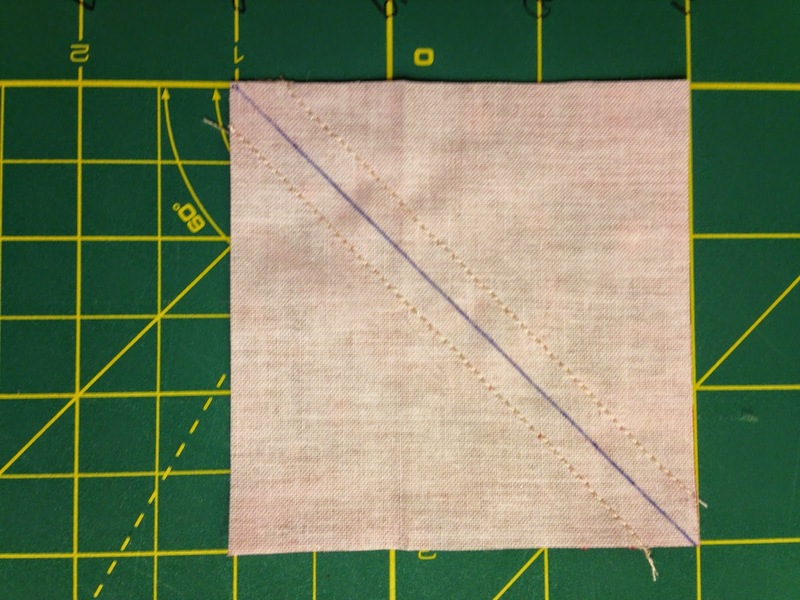 Sew 1/4" from the diagonal line on each side. Cut on the diagonal line. Press to the red triangle. 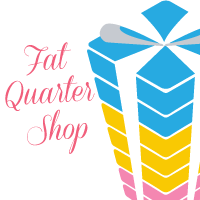 Square to 3 1/2". Lay the half square triangles made above as illustrated below to form the pinwheel block. Sew together. I like to chain piece the sets. I also like to do the "twirly" center to reduce the bulk in the middle of the pinwheel. The pinwheel should measure 6 1/2". 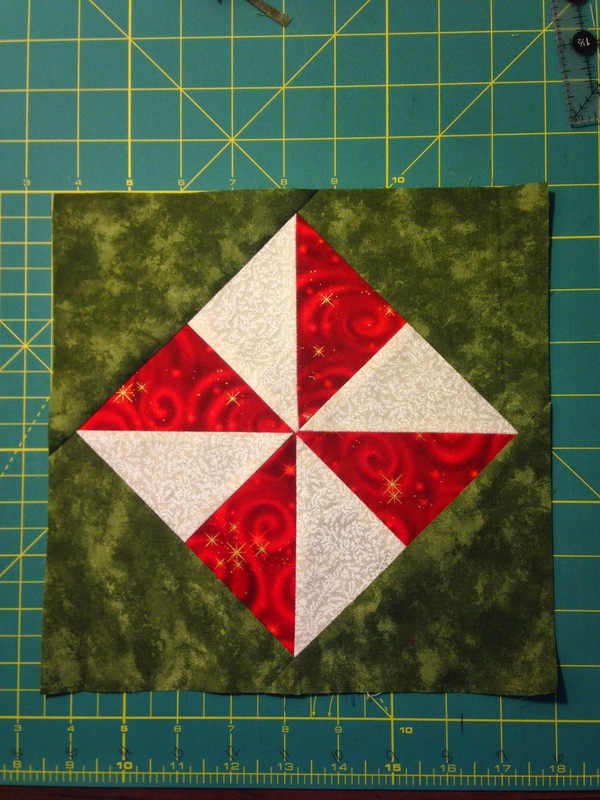 Repeat for a total of 3 pinwheel blocks. 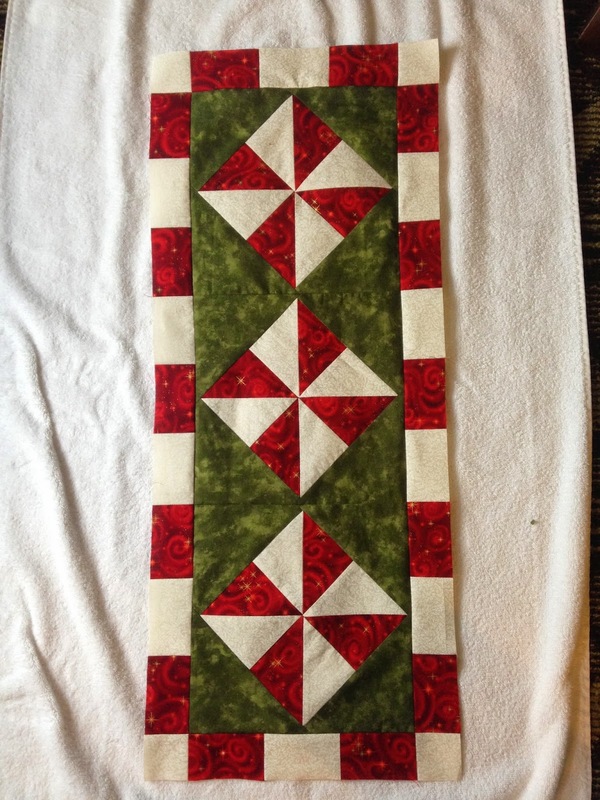 Sew a triangle to the top and to the bottom of the pinwheel block. Press to the green. 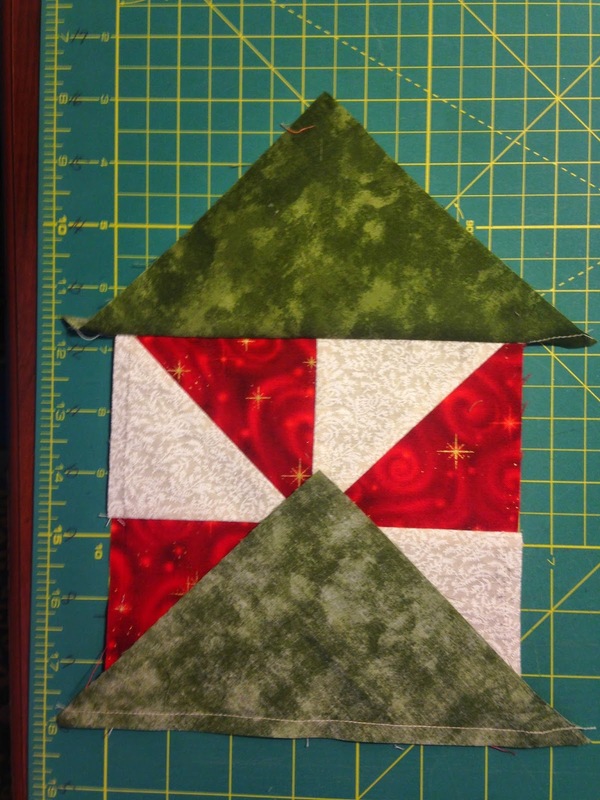 Trim off the "dog ears" and then sew a green triangle to each side of the pinwheel unit. 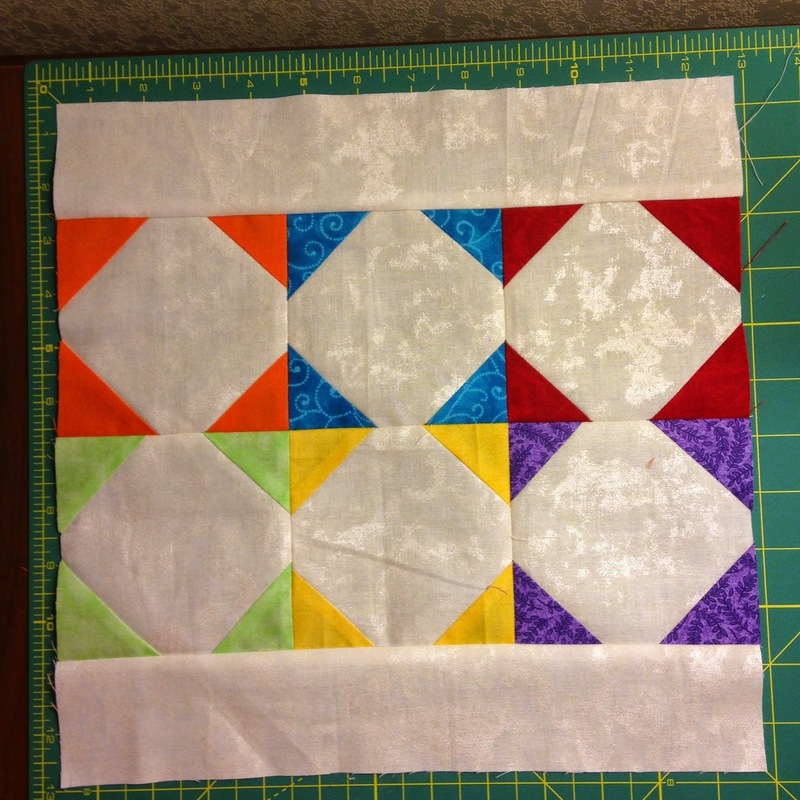 Square the pinwheel block to 9 1/2". 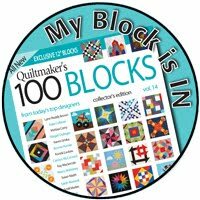 Repeat for a total of 3 pinwheel blocks. 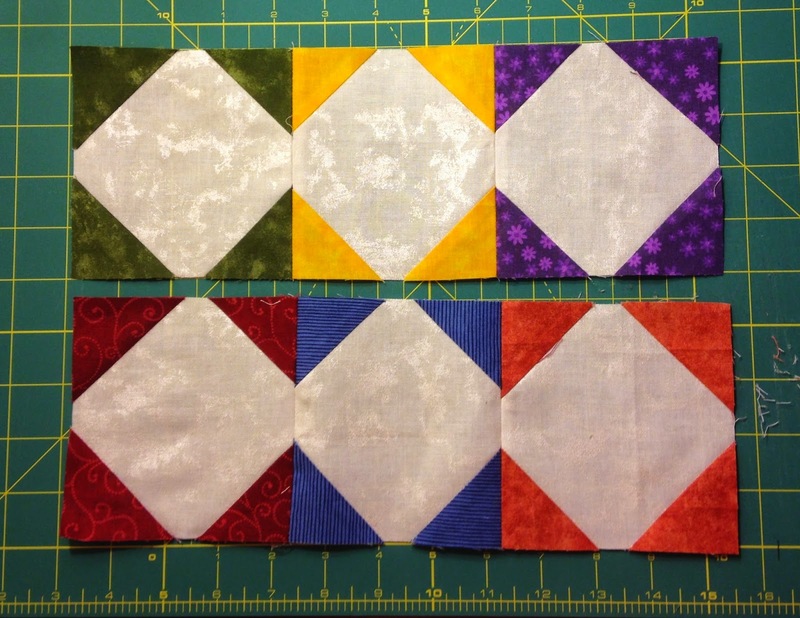 Sew the 3 pinwheel unit blocks together as illustrated below. 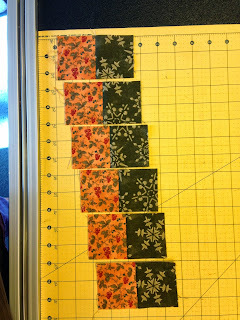 Sew 5 red 2" x 3 1/2" rectangles end to end with 4 white 2" x 3 1/2" rectangles to make a strip unit 2" x 27 1/2". Repeat for a total of 2 strip units. 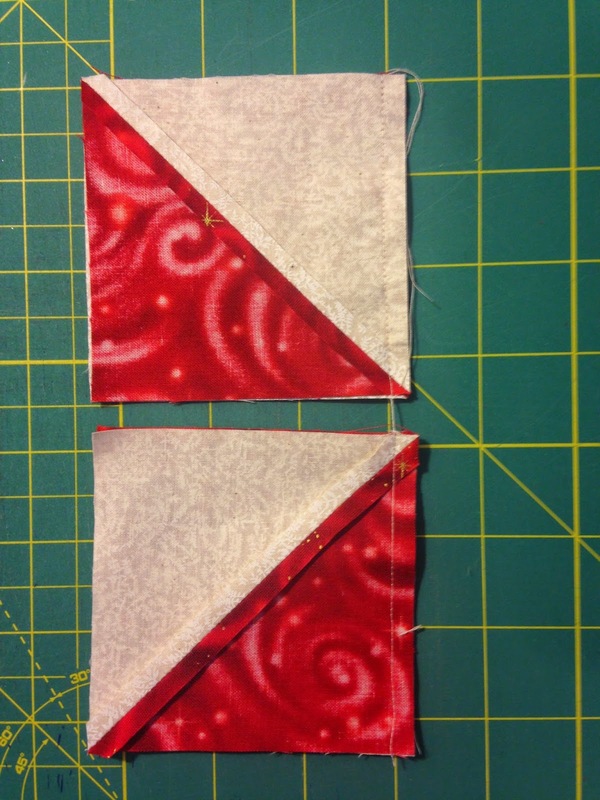 Sew the strip unit to each side of the pinwheel unit as illustrated below. 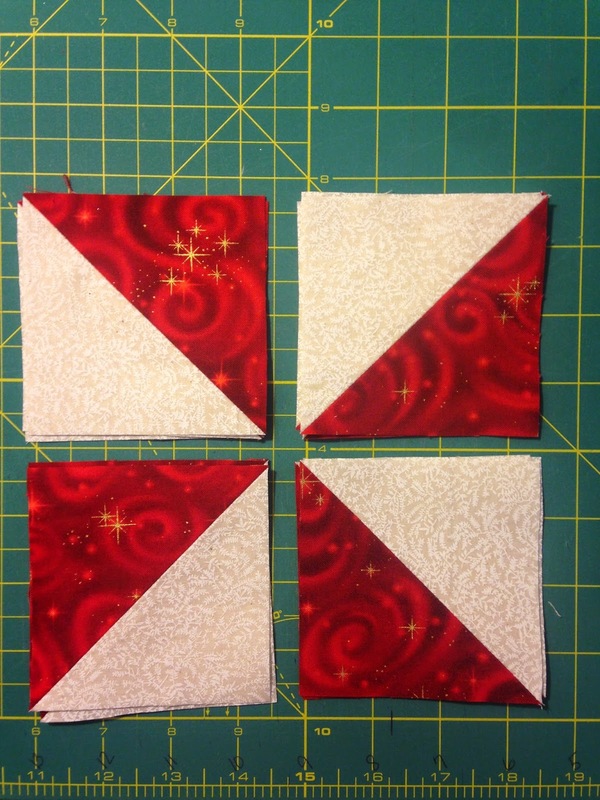 Sew a white 2" square, a red 2" x 3 1/2" rectangle, a white 2" x 3 1/2" rectangle, a red 2" x 3 1/2" rectangle, and a white 2" square together end to end to form a strip set 2" x 12 1/2". Repeat for a total of 2 strip units. Sew one to the top and one to the bottom of the pinwheel unit. 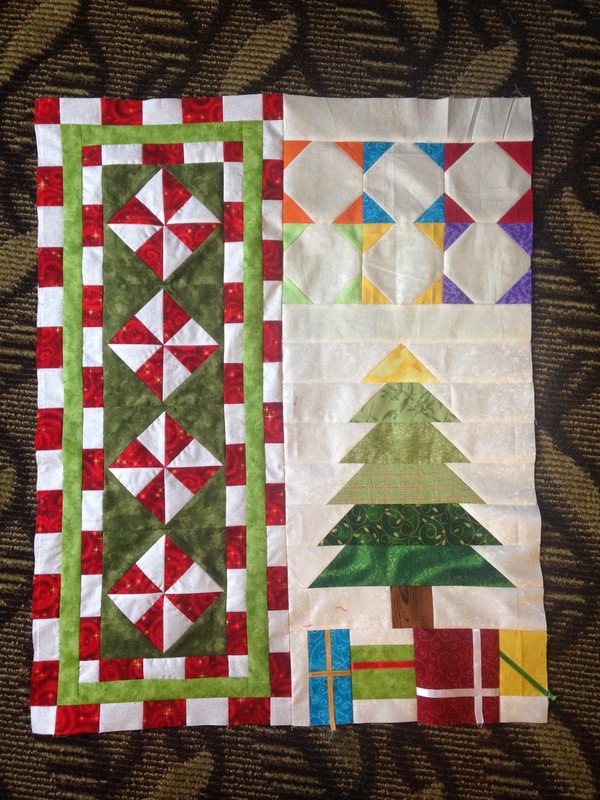 Sew the pinwheel unit to the left side of the tree unit. Whoo Hoo! 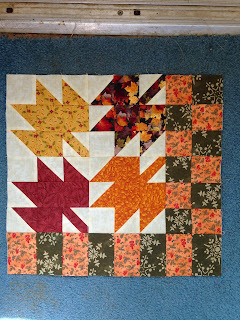 You have finished all of the block units for the 2014 Mystery Seasonal Sampler. 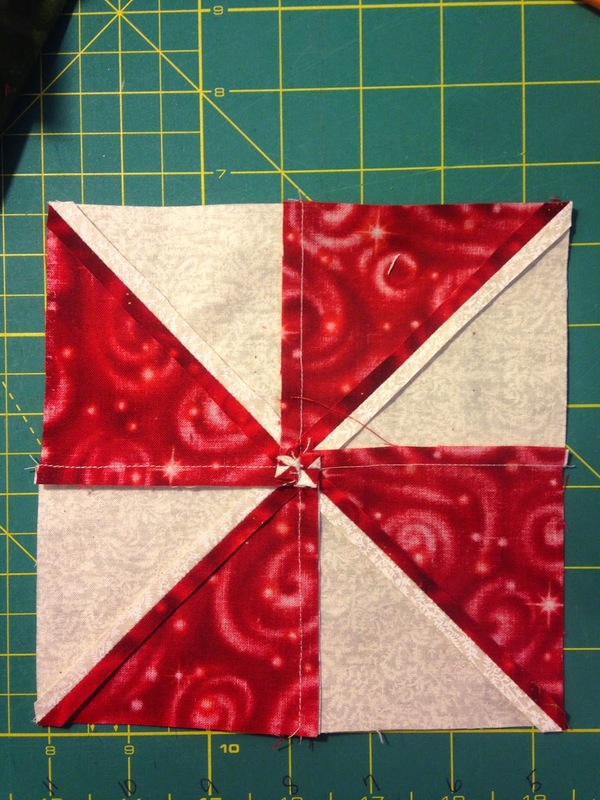 And yes, my pinwheel unit block looks a little different than the one I gave instructions for. 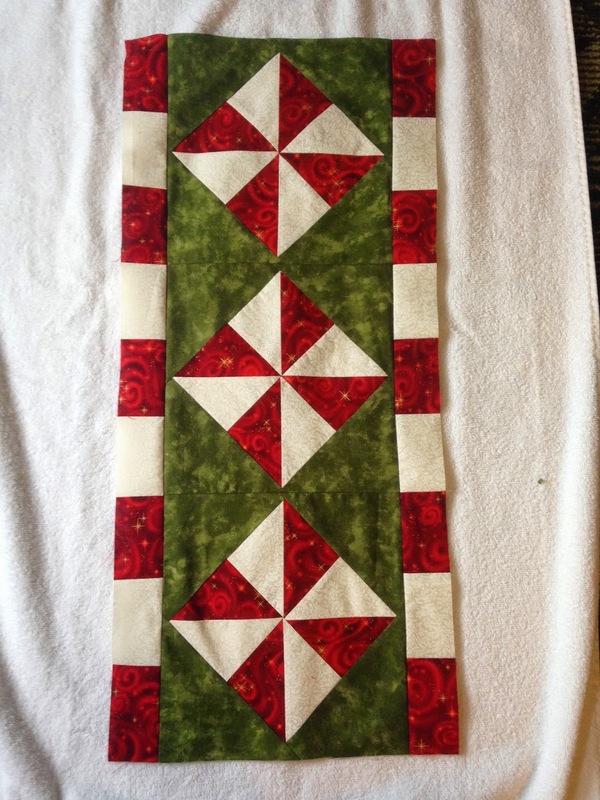 I made this table runner and never finished it because I thought it was too small for my table. I remember having it so I thought it should be in this quilt. It was the perfect size. However, I used someone else's pattern so I couldn't give you instructions for it specifically. I had to alter it to make it mine. Now, on to a little more housekeeping on some previous blocks. Sew the snowball block and the friendship star block made in July to each other as illustrated below. 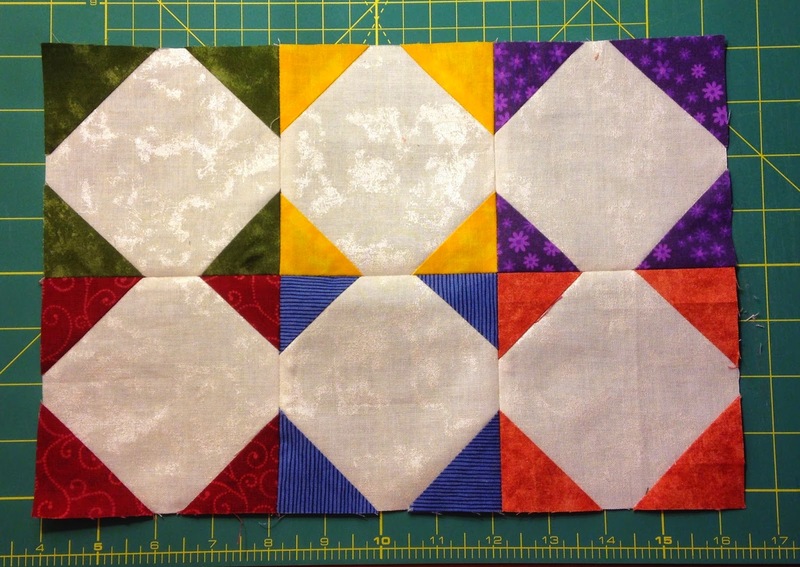 Then sew the churdash block made in July to the right side of the snowball/star block unit. Sew the Star Flag to the top of the above unit as illustrated below. 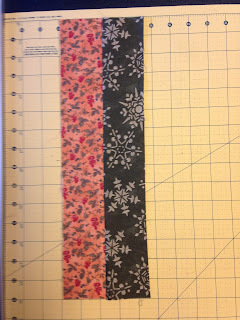 Now sew 5 background 2 1/2" squares to 4 "colored" 2 1/2" squares alternating each into a strip set 2 1/2" x 18 1/2". 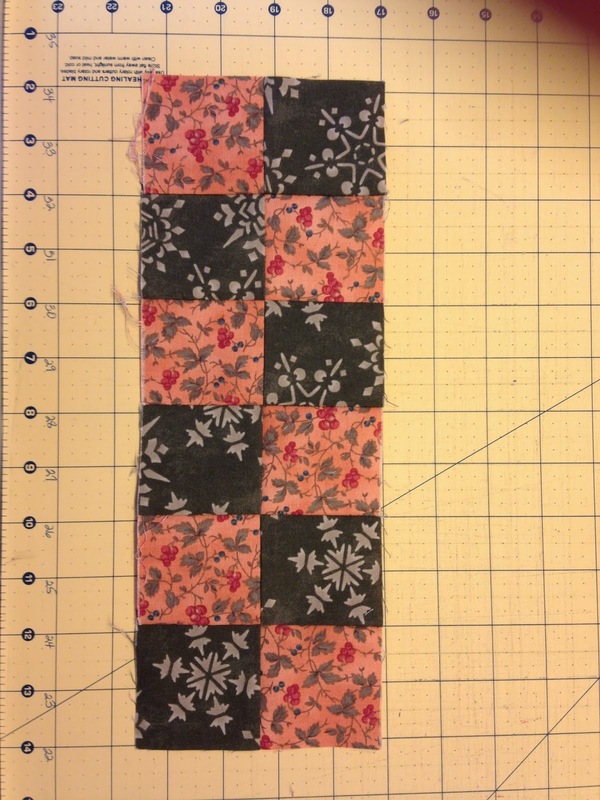 Sew this strip unit to the right side of the block unit made above. 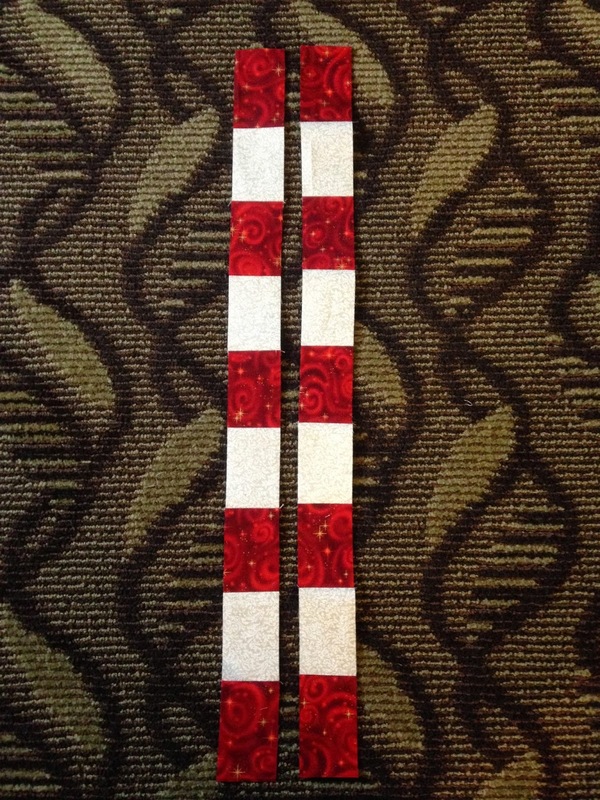 Now sew 2 coordinating 2 1/2" x 22" strips together as illustrated below. Sub cut the strip set into 10 units 2 1/2" x 4 1/2". 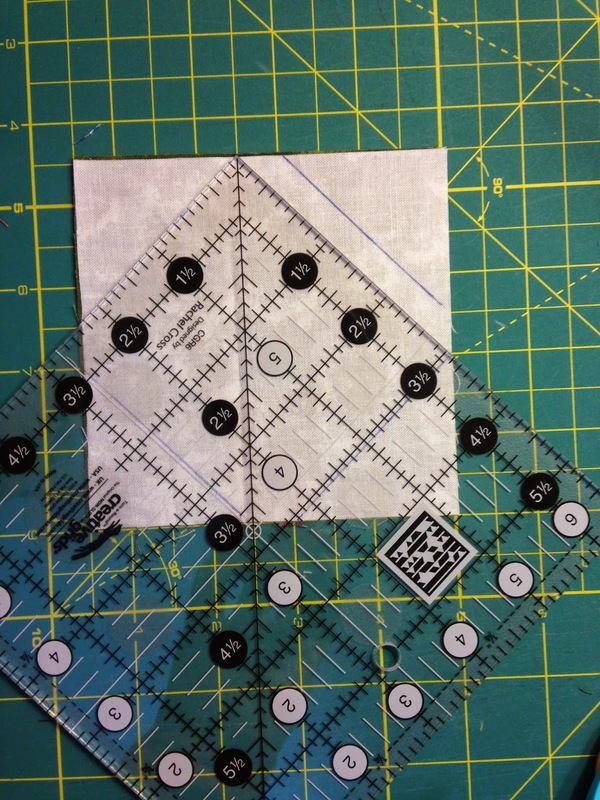 Sew 6 of the units into a checkerboard unit 4 1/2" x 12 1/2" as illustrated below. 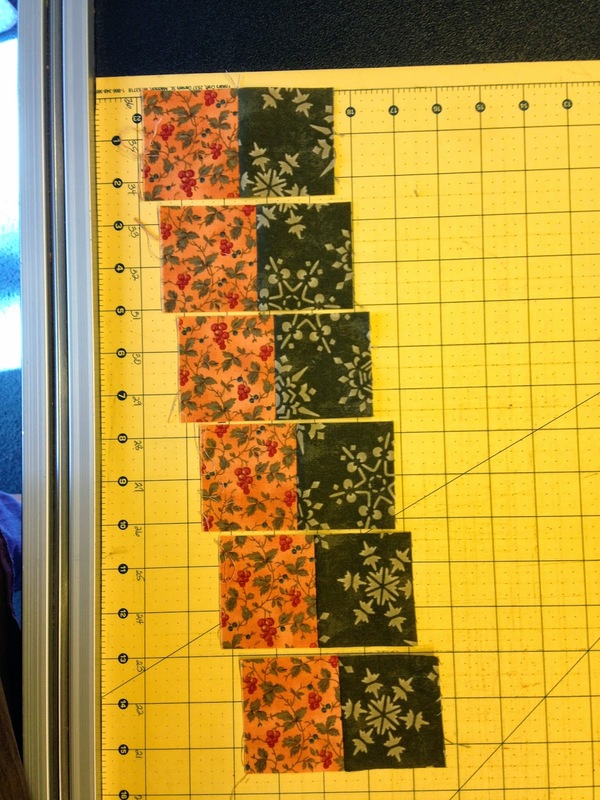 Then sew the remaining 4 - 2 1/2" x 4 1/2" units together end to end to form a strip set 2 1/2" x 16 1/2". 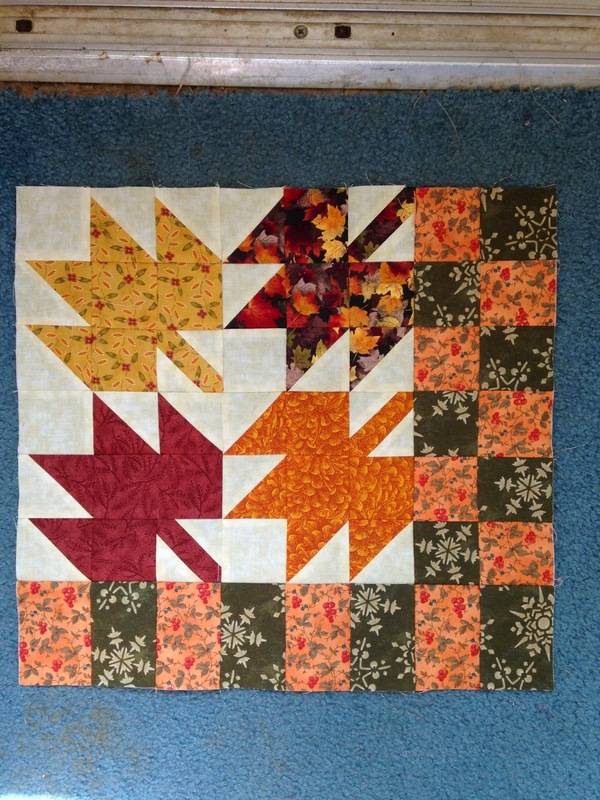 Sew the 4 1/2" x 12 1/2" checkerboard unit to the right side of the leaf block. Sew the 2 1/2" x 16 1/2" unit to the bottom of the leaf unit. Whew! Take a break and enjoy the holidays. We will set the quilt together in January and add the borders. Do you have all of your flying geese finished? 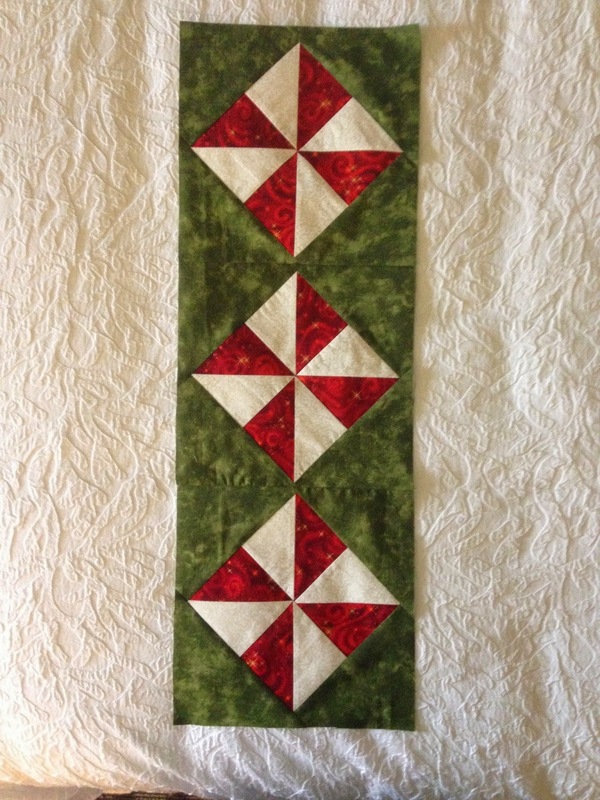 I've loved this quilt and cant thank you enough for sharing the pattern with us. 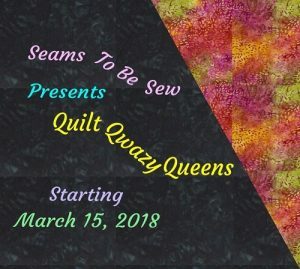 I've been checking all through January to see about putting the quilt together like you indicated. I hope all is well with you and your family and hope that you will have the time to post finishing instructions. Thank you. L.